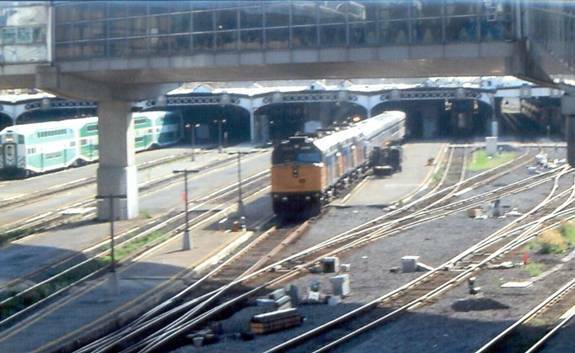 ����������������������� In early 2000, VIA Rail Canada reintroduced overnight Toronto-Montreal service with a train called the Enterprise. At first, the train ran with Hep2 coaches, Chateau type sleeping cars, and a Park car, (dome observation-sleeper-lounge). In summer of 2002, the Enterprise became the first train to be equipped with the Renaissance cars. ����������� In the summer of 2005, I read on a train discussion board that VIA was going to discontinue the Enterprise. I figured that since I rode the Three Rivers back in February, which was going to be cut, that I would ride the Enterprise. I also decided to book a sleeper. This trip would also be the first trip I had taken since former Toronto Transportation Society president/member Ray Neilson died of cancer. My friend Mark heard that I was going to take this trip, and asked if he could come too. I decided that it would be okay. I chose the date of Monday, August 15th, exactly one month before the Enterprise would be discontinued for the day of departure. I chose this date because things were really busy at work, and I wanted to arrive back in Toronto on a Tuesday, Thursday, or Saturday to film the tri-weekly Canadian departing for Vancouver. 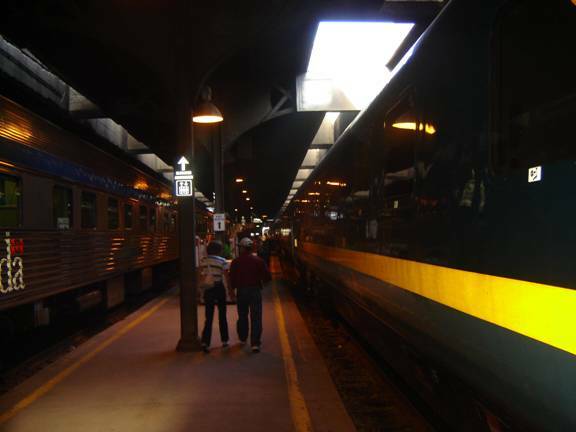 The plan was to ride VIA Rail�s express Toronto-Montreal train, mess around Montreal for an hour, then get back onto the Enterprise. ����������� Mark invited me to his house early that afternoon. After about an hour or so, Mark�s mom insisted on taking us to the subway for us to get down to Union. She might have thought that you had to be at the train station two hours before departure like at the airport. I told her we had to be there 30 minutes before, but she insisted �just in case there�s a delay on the subway or something�. I backed down as she gave Mark and me a ride down to the subway. We ended up arriving at 2:30, two and a half hours before VIA train 66 was supposed to depart. We decided to get something to eat from the Harvey�s in the station. After lunch, we headed over to the skyway to photograph trains. I took a picture of a couple GO trains, and VIA train #75 departing for Windsor. We then saw the consist of train 66 arriving into Union station from the Toronto Maintenance Centre, but neither one of us photographed it. The train consisted of VIA P42DC #919, two VIA 1 class LRC coaches, and an economy class VIA LRC coach. ����������� Soon, we headed back to the main VIA Rail departure area. We then lined up at the gate train 66 would board. A VIA Rail employee was looking at our tickets and telling us which seats we were assigned. Eventually, it was time to board. Mark and I boarded the last coach in the train and took our assigned seats. The train left on time. ����������� As we raced past the TTC�s Greenwood subway yard, I filmed the equipment in the yard, including the former Gloucester class equipment used as part of the two rail grinding trains. The conductor was also explaining how to exit the train in case of an emergency. ����������� Train 66 raced through Guildwood and Oshawa stations since train 66 is an express train and makes only one stop between Toronto and Montreal. We raced through other towns and cities along the route. 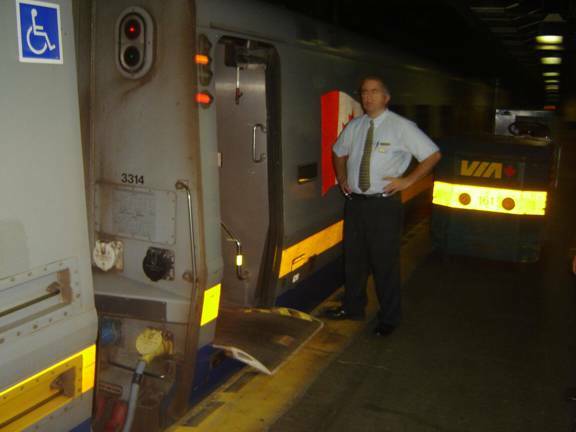 ����������� Like many other VIA trains in the Quebec City-Windsor corridor, train 66 doesn�t have a caf� car, so attendants push cars down the aisles, serving passengers at their seats like on a plane. Mark and I bought our dinner in that fashion. Mark had some nachos and cheese while I had a ham and cheese sandwich. ����������� Soon, the sun went down. Train 66 made its only scheduled stop at Dorval which is 20 minutes outside of Montreal. After we left, we were still making good time and arrived in Montreal a few minutes early. 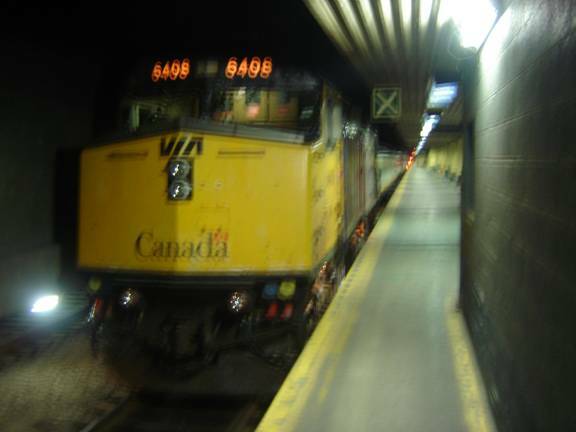 ����������� After Mark and I got off train 66, I took two photos of the train and a 2 second video of a Renaissance equipped train that had come in from Quebec City backing out of the station heading for VIA�s Montreal Maintenance Centre. ����������� Mark and I headed into the station and after we explored the station a bit, we decided to ride the subway. 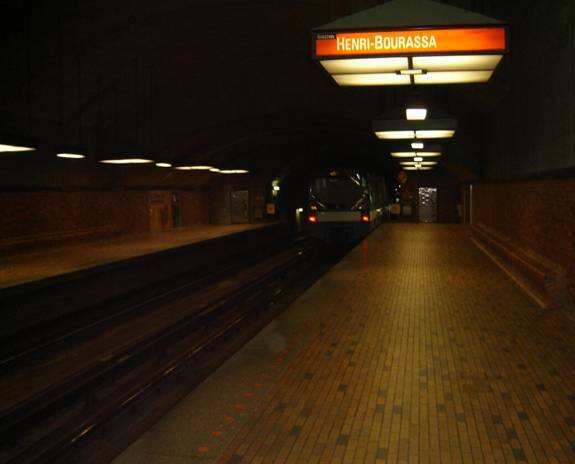 We got on the Orange line train where we rode to Berri-UQAM station where the green and yellow subway lines connect. Mark and I transferred to the yellow line since there are only three stops on the line. After our ride on the yellow line, we got on a green line train. 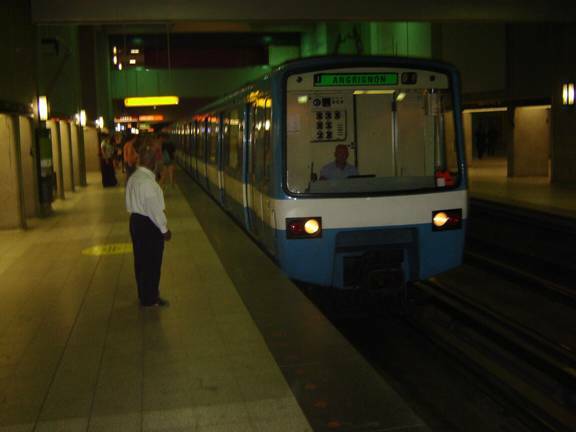 One thing about the green line is that it uses the original stock bought for the Montreal subway in the mid 1960�s and the other three lines use newer stock. After we got off the green line train at Lionel-Groulx, we transferred back to the Orange line and rode back to Bonadventure station to head back to the train station. ����������� Since Mark and I were traveling in a sleeper on the Enterprise, we were allowed access to VIA�s Metropolitan lounge. About an hour before the Enterprise�s scheduled departure, sleeping car passengers were allowed to board. Mark and I boarded Renaissance sleeper #7506 and quickly got settled into our room. I opted for the lower bunk. We then asked the conductor if we could go out and take pictures of the train. They friendly allowed us, and Mark and I did just that. ����������� Leading the Enterprise was F40PH-2 #6408, which was still in the Spiderman 2 advertising livery. After taking a couple photos, we got back on the train. ����������� The Enterprise departed on time and shortly after we left, the caf� car opened. Mark and I headed there where we were given complimentary bags of chips. Soon, we decided to turn in after requesting a wake up call at 7:00 am for continental breakfast. ����������� Shortly after midnight, Mark and I went to bed. As we tried to sleep, we were interrupted several times by the Renaissance cars� suspension mechanisms. They made a noise that sounded like Donald Duck being choked to death! However, VIA provided two pairs of earplugs! 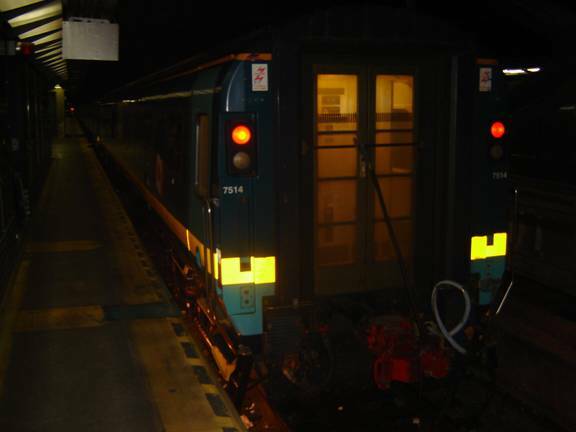 ����������� While I did get some sleep, I woke up while we were stopped in Kingston, where the train was coupled onto the rear of another VIA train. 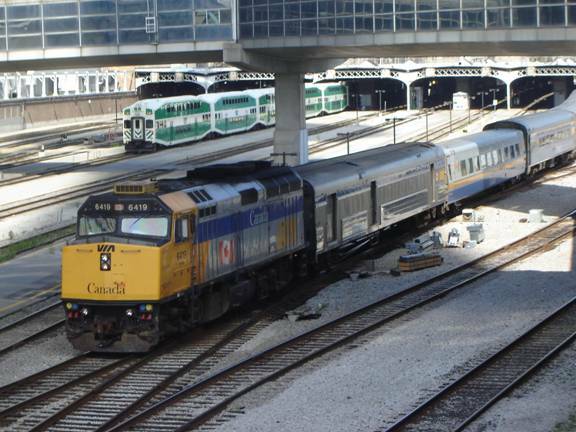 This train now consisted of VIA P42 #917, three economy class LRC coaches, one VIA 1 LRC coach, F40PH-2 #6408, a Renaissance baggage car, two Renaissance coaches, a Renaissance caf� car, and two Renaissance sleeping cars. I went back to sleep and soon, got up as we were stopped in Cobourg. Mark and I got dressed then headed to the caf� car for breakfast. Shortly after breakfast, a VIA attendant was changing our room to its daytime configuration. We stopped in Guildwood. I wanted to once again film the Greenwood subway yard as we went past it, but my digital camera was being problematic which resulted me missing filming the yard. However, the problem soon fixed itself as we neared Union station and I filmed some of the coaches on the transcontinental Canadian which was on the adjacent track. We arrived on time. As Mark and I gathered our stuff and headed out into the hallway, we were blocked by a little kid throwing a temper tantrum in the aisle. I said to the kid, �You make a better door than rug.� The kid eventually moved aside as we got onto the platform. I took some pictures of the Enterprise and the Canadian. After we got to the main concourse, Mark and I sprinted to get to the skyway before VIA train 97 departed for New York. We got there just to get a half decent shot of the train pulling out. I then took a picture of it. Mark and I set up outside the skywalk to film the Canadian as it departed. We filmed the Enterprise deadheading to the Toronto Maintenance Centre. I also took a photo of the Northlander passenger train awaiting its 8:55 am departure. ����������� Soon, it was 9:00 am, the Canadian�s scheduled departure time. Baggage was still being loaded. 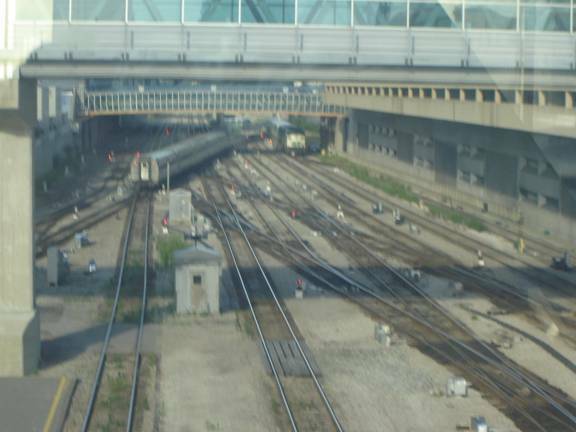 Several GO trains and a few VIA trains arrived into Union station. 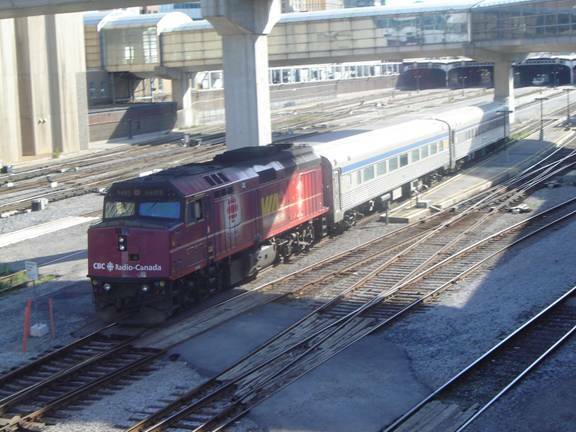 One train had the unit VIA did up to commemorate the Canadian Broadcasting Corporation�s 50th anniversary. Mark and I took pictures of that train. ����������� Mark and I were still waiting for the Canadian to depart. Finally, at 9:37, almost 40 minutes late, the Canadian pulled out. Mark and I filmed the 26 car train pulled by three F40PH-2s. Once it had left, we headed back to Mark�s house after encountering a �Bustitution� on a section of the subway. ����������� This trip was pretty enjoyable. Plus having a friend along was also good. On September 15, 2005, the Enterprise departed Montreal and Toronto for the last time. After that, the Enterprise was replaced by a train that left Toronto at 10:00 pm, arriving at Kingston at 12:29 am, where it is wyed and leaves at 5:25 am, arriving into Toronto at 8:20 am.